In my gap year between undergrad and grad school, I worked for Tom Abel as a research assistant at the SLAC National Accelerator Laboratory. In this project, we showed that galactic magnetic fields can be sufficiently seeded by magnetic supernova remnants. The main points of this work are summarized below. For a more detailed account, check this out on the arXiv! Figure 1: The edge-on (left) and face-on (right) projections of the magnetic field strength (top), density (center), and temperature (bottom) of galaxy g80LR at t = 2.1 Gyr in 30 kpc boxes. Magnetic field streamlines are plotted in black over the image of the magnetic field strength. Magnetic fields are observed across all types of galaxies throughout cosmic time. The observed magnetic fields exhibit long-range structure throughout the disk, reaching strengths around 1-10 microGauss. Galactic magnetic fields influence the galaxy's pressure profiles, star formation rate, and cosmic ray transport processes. The co-evolution of galaxies and their magnetic fields is thus a complex and deeply significant problem. The history of our galaxy's magnetic field certainly includes a type of dynamo process, through which kinetic energy is converted into magnetic energy. It has long been appreciated that galactic differential rotation can enhance preexisting "seed" magnetic fields maintain the final magnetic field as well as maintain the existing magnetic field near equipartition levels. However, because the galactic rotation period is long, this method requires the magnetic seed field to be present at the time of the Milky Way's formation. A more modern view is that seeding by means of astrophysical processes, such as battery mechanisms, kinetic instabilities, or stellar feedback, would be of greater consequence than a primordial seed field. Furthermore, this type of dynamo action is expected to grow the magnetic field at the turbulent diffusion rate, which is significantly faster than the orbital shear rate. In this work we address the question of how the magnetic field in a disk galaxy like the Milky Way would have evolved under the influence of stellar feedback alone. Within this narrative, the first significant magnetic fields would have been generated by turbulent convection within the interiors of early stars, and then dispersed by their winds or supernova explosions. Such feedback would inject magnetized plasma into the interstellar medium (ISM), while simultaneously driving turbulence that acts to disperse and amplify the field. Our results (see below) are based on simulations of an initially unmagnetized galactic disk (see Figure 1), coupled with a realistic prescription for star formation and magnetohydrodynamic (MHD) supernova feedback. Figure 3: All-sky RM map for the g80LR run at ∼ 2.4Gyr with Tthres = 13,000K and an origin 8 kpc away from the center of the galaxy. The angular power spectrum of this map is shown in Figure 7. The presence of magnetic fields is inferred by measuring the angle of scatter of electrons. In Figure 3, we use the same technique to create a synthetic Faraday rotation observation of our simulated galaxies. 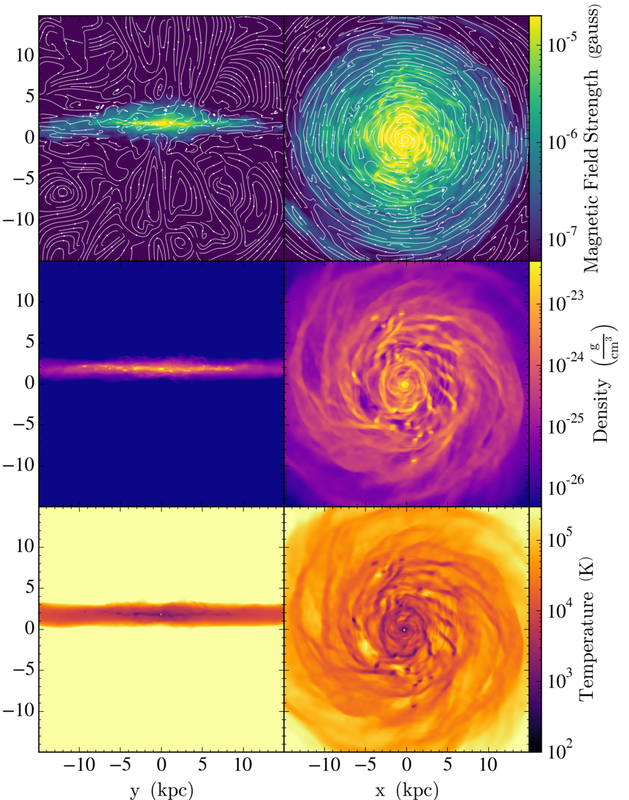 Although we started our with a highly idealized setup, our simulations are able to qualitatively reproduce magnetic fields that are similar to that in our own Milky Way.